I’m not a diver but I’m a cook so I feel fortunate to have been invited on a camping trip with a bunch of abalone divers. I’m always happy to let my imagination run wild in the camp kitchen. And even happier to be able to eat copious amounts of one of the last wild foods available to us. After my chilly weekend at Van Damme State Park in Mendocino, I have a new appreciation for abalone and the divers who harvest it. Because you know what? It’s not that easy to catch abalone. You may think, “How hard can it be? It’s not like they run away or anything, right?” And though abalone can’t technically move fast enough to flee from divers, they do have other deterrents at the disposal. As does the Calfornia Department of Fish & Game. First of all, while there are seven of species of abalone in California, the only ones the divers are allowed to take are Red Abalone no smaller than seven inches in diameter. To preserve the population, licensed divers are allowed three abalone per day with a maximum of 24 per season. The season runs from April through November with a closure in July. 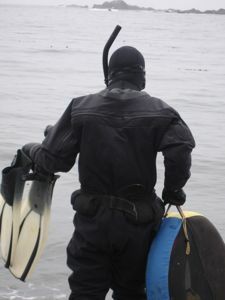 Regulations also prohibit the use of oxygen tanks, so would-be abalone divers have to be highly skilled. Imagine diving down to a depth of 20-30 feet in freezing water, while holding your breath. Once you’re down there, you have to find the abalone, make sure they are the proper size and species and then move swiftly to pry them off the rock with a special tool. Tip them off to your presence and they seize onto the rock, making it impossible to remove them. One strike and you’re out. The seas can be rough, and visibility can be low, adding to the difficulty. For these reasons it’s also dangerous. 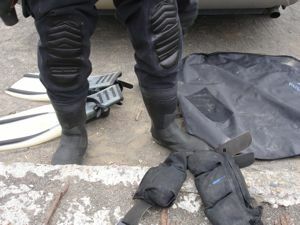 Emergency responders in Mendocino County rescue about 15 abalone divers each year. 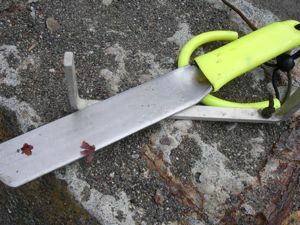 Nearly every year, somebody dies while diving for abalone. Last year’s death count was three. Lets say you’re diving and you make it back to the surface with your abalone and head to the campsite to relax. First you have to pry the abalone out of their shells (this sounds nicer than saying you have to kill the live mollusks), and then you must trim out their goopy reproductive and digestive organs, as well as the black edges and the tough bits of the “foot.” Finally you have to pound the hell out of them or they’ll be too tough to eat. Then you can relax while someone else cooks them (if you’re lucky). In reality, most divers do cook. Usually they grill it, poach it, or slice, pound, bread, and pan-fry it. All are perfectly respectable ways to enjoy the sweet, oceany flesh. On the third meal, something a little different was in order. I’ve made ceviche with abalone at home previously, but I wanted to do something a little different, so I brought along some kumquats to go with the usual ceviche flavors. The chowder was entirely unplanned. It was an incredibly cold weekend and, on one of our frigid hikes, Haven and I were fantasizing about chowder. We had potatoes in the cooler. 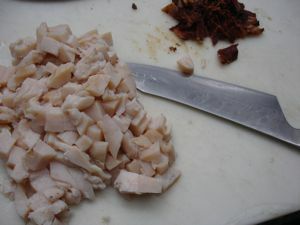 We thought if only we had cream and bacon, we could make a fabulous abalone chowder. Luckily one of the other campers had both cream and bacon so our dream came true. Here are the recipes—proportions are estimated. We cook by feel in the campsite. Toss all of the above in a bowl and let sit for at least 30 minutes or up to 24 hours. Put the abalone trimmings, onion, and bacon in a pot and cover with cold water. Bring to a boil and simmer slowly for 1 to 2 hours, strain. (can be made one day ahead and refrigerated). cent. Add the broth and bring to a boil. Add the potatoes and simmer until tender. (I added water to stretch it here because the broth was super flavorful) Add the abalone, bacon and cream and simmer until the abalone is tender, about 5 minutes. Season to taste with salt and pepper. Serve immediately. 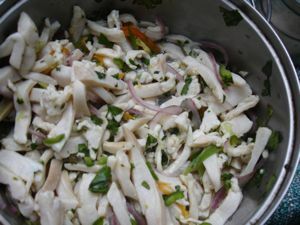 This entry was posted in Latin American, food sustainability, healthy, hearty, seafood. Bookmark the permalink. Post a comment or leave a trackback: Trackback URL. I wanted to personally thank you for the recipes. 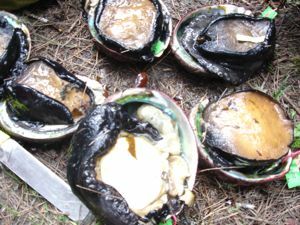 My husband is an Abalone diver and while I consider myself a foodie and an above average cook, I usualy end up throwing the Abalone I cook into the trash. I blame it on my east coast roots and my relatively new relationship with Abalone. The ritz crackers bit is so boring and I was out of ideas after trying several recipes. We got back late last night after camping at Albion and I am excited to try the chowder recipe. thanks for stopping in. I’m glad the recipes are helpful. Let me know how your chowder turned out!